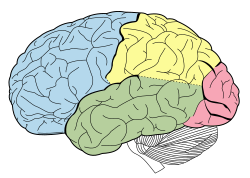 The parietal lobe is a part of the brain positioned above the occipital lobe and behind the frontal lobe. The parietal lobe brings together information from different senses, particularly spatial sense and navigation. For example, it uses input about touch, balance and the visual system. This enables the parietal cortex to map seen objects in relation to the body (into 'body coordinate positions'). This makes it possible for a person to reach out and handle objects. The name derives from the overlying parietal bone, which is named from the Latin pariet-, = 'wall'. ↑ "PARIETAL - meaning in the Cambridge English Dictionary". dictionary.cambridge.org.